To celebrate the release of their new album 'Eyes and Nines', Spencer Pollard of California's own Trash Talk spoke to Alter The Press! about how the band got originated, setting up their own label, Trash Talk Collective, the new album and more. Alter The Press: How did the band come together? Spencer Pollard (bass): Lee (Speilman, vocals) wanted to start a band back in the winter of 2005 and everyone kinda found there way into the band one way or another. We played a lot of shows around Sacramento for the first few months and decided to do a tour fairly quickly in our existence. Once we hit the road we never wanted to to turn back, so we haven't. ATP: What made you want to set up you're own label, Trash Talk Collective? Spencer: We liked the idea of releasing our own records so we decided to do it. We did a few records with a few different labels and got a pretty good view of what it took to release a record. We've faced our share of difficulties but it's been a really rewarding experience in the long run. When we first started out doing the TTC thing, there was a huge learning curve. Now we've kinda figured the whole thing out a little better. ATP: Being on the road the majority of the time, who looks after the business side of things? Spencer: We have friends or family members who are willing to help out with mailorder while we're on the road, but we still handle the "business side." 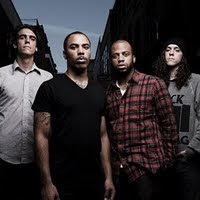 ATP:What made you want to leave Deathwish Inc? ATP: Have you any plans on releasing any other music besides Trash Talk on the label? Spencer: We're toying with the idea of doing a release or two but it's tough. There's not really a whole lot of bands who really stand out like that who aren't already doing something of their own. ATP: How did you end up signing to Hassle Records in the UK? Spencer: We met Wez a couple years back at SXSW in Austin and got to talking. They showed some interest in working with us and when we were thinking about who to release the record with in the UK they were the logical choice. ATP: Your new album 'Eyes & Nines' was produced by Joby from The Bronx, how was it working with him? Spencer: Joby's a good friend of ours so working with him was very relaxed. The recording process was laid back and we were able to let the record develop in the studio. ATP: How has the Alexisonfire US tour been going so far? Spencer: The tour's been great. We've got a lot of dedicated fans who come out to see us so we've felt pretty at home at most of the shows. Those kids mixed along with the crowd who have come to see Alexisonfire or La Dispute have made for some really fun shows. ATP: Besides the one London show announced in August, when can we expect you back for a UK tour? Spencer: We're doing several dates in the UK in August including some festivals. We've done some talking about coming back over in October to do some UK shows. Spencer: 'Eyes & Nines' is out now. Surf on over to www.trashtalkhc.com and pick up a copy or two. 'Eyes & Nines' is out now on Trash Talk Collective/Hassle Records.